I purchased the GJ lock tools Ultion pick a few months back due to the high numbers of Ultion locks we are now seeing. 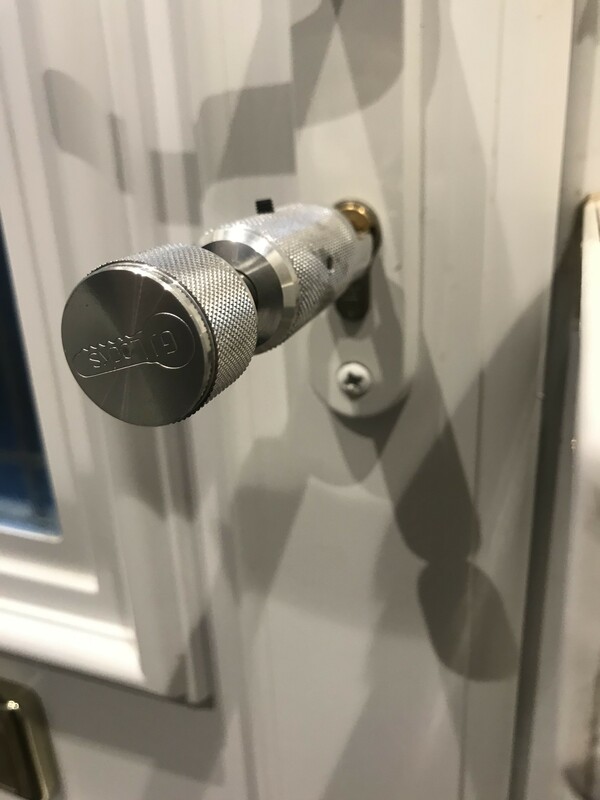 Ultion is now fitted by a huge number of Locksmiths and also comes as standard in many new upvc and composite doors from various companies. It’s inevitable you are going to come across one that needs opening sooner or later. With Ultion having such a tight keyway it can be awkward to get standard picks in the correct position unless you have some really thin picks with a small end flag. This is where the GJ pick really comes into its own, it makes picking Ultion very easy (with practice) and comfortable. 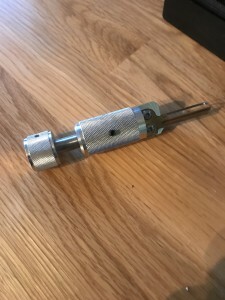 The tool is designed to pick Brisant Ultion and also Brisant D. Upon unboxing the tool it’s clear straight away that it’s a quality bit of kit. Just like all GJ tools it feels very well made and more importantly very shinny! In the box there’s 2 key blades, one for Ultion and one for Brisant D, an Allen key, tensioning arm and the actual body of the pick. The concept is very simple, choose which key blade you require depending on the lock been picked. Insert the key blade into the tool and tighten. Insert the key blade into the lock and pick away! The actual pick wire is self contained within the body of the pick and is controlled via sliding back and forward to get onto the required pin. The pick wire slides down the side of key blade and is already all pre set with the correct spacing between the pic wire and the side of the key blade. The pick also has a clicker system built in a bit like the multi lock picks that have been around for years. It tells you what number pin your on top of and clicks to let you know when you have moved from one pin to the next. A really nice feature of the pick is that the clicker can be enabled and disabled by tightening or slacking a grub screw. This way it ensures that pick can be changed depending on personal preference whether or not you want to use the clicker system. For me the GJ pick is massively effective! The picking style will probably be slightly different to what your used to. There is a certain technique to it, I’ve heard a few people on various forums say there struggling with it. This is presumably because they haven’t nailed the technique. I’m not going to go into any details in this post of picking methods and techniques but there is a video released from GJ lock tools showing the best technique for this pick. Follow the guide and locks will start falling open. I’m not going to link to this video as it’s an unlisted YouTube video meaning you need the link to see it and isn’t available publicly. It can be viewed using a link on various locksmith forums. However if your not on these particular forums I’m pretty sure GJ will send you the video if you purchase the tool. 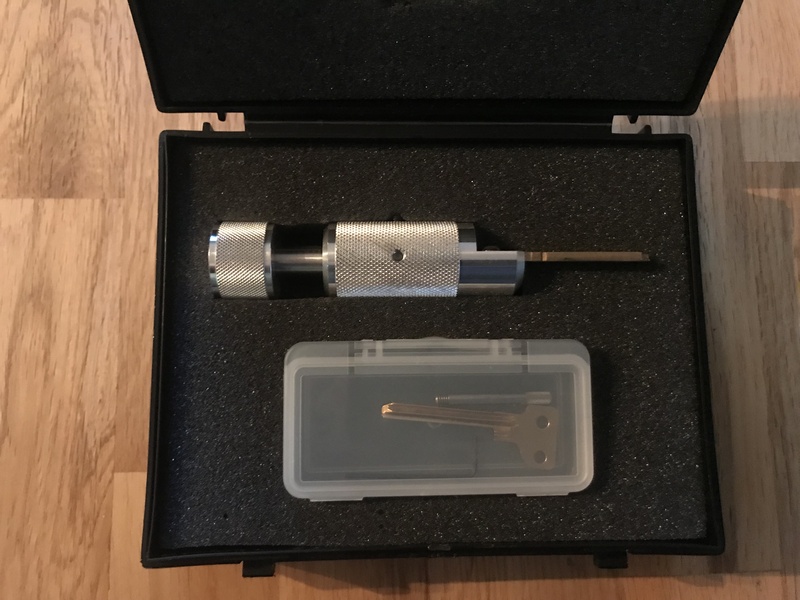 In my mind Ultion is still the most secure Euro that money can buy and fortunately GJ lock tools are very sensible about who they sell there tools too. GJ only sell tools to Known Locksmiths and big lock suppliers who only supply to the trade. These are the only channels to go through to purchase there tools. Wouldn’t it be nice if the same could be said for all locksmith tool suppliers! Please free free to share this post or upload to your own websites. All links must be left in place!